Ancient Light is the title of my thesis exhibition at the University of Hawai‘i at Manoa. The idea originated during the first year of the graduate program after NASA's research of the age of sunlight. 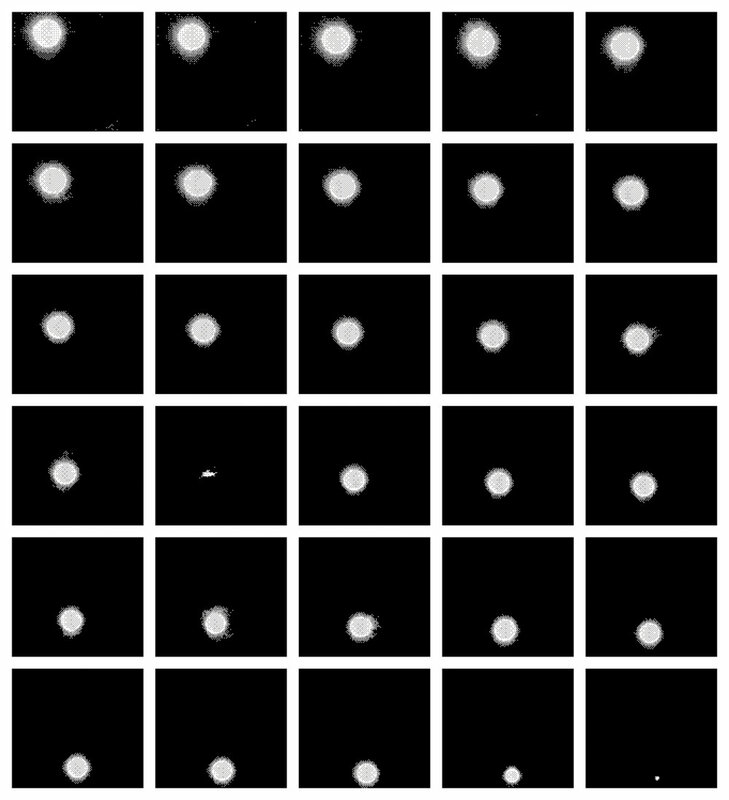 According to R. Mitalas and K. R. Sills, photons generated within the core of the sun undergo constant absorption and transmission between matter within the interior -a process called photon diffusion. Their paths are wandering and seemingly random, taking between 10,000 to 100,000 years to break the surface to reach Earth. The fact the light illuminating my present is older than written human history prompted me to explore time beyond our experience. 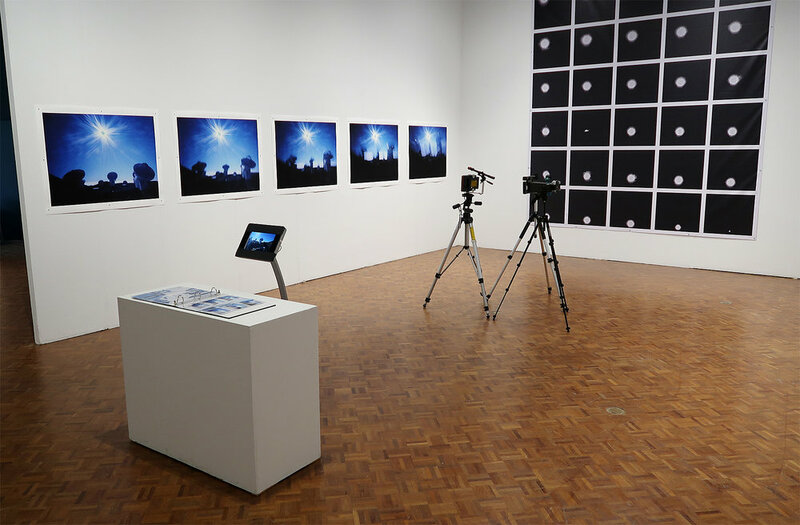 Directly utilizing this ancient light, the project employs photographic capture methods informed from pivotal scientific understandings of the sun, earth, and light. Through the accumulated past of science and photography, I visually explore the imperceptible qualities of time to question the nature of reality and our perception. "Sub-Millimeter Array at 970MPH" Archival Pigment Print from Fujifilm FP-100C Instant Picture, 30"x40", 2017. 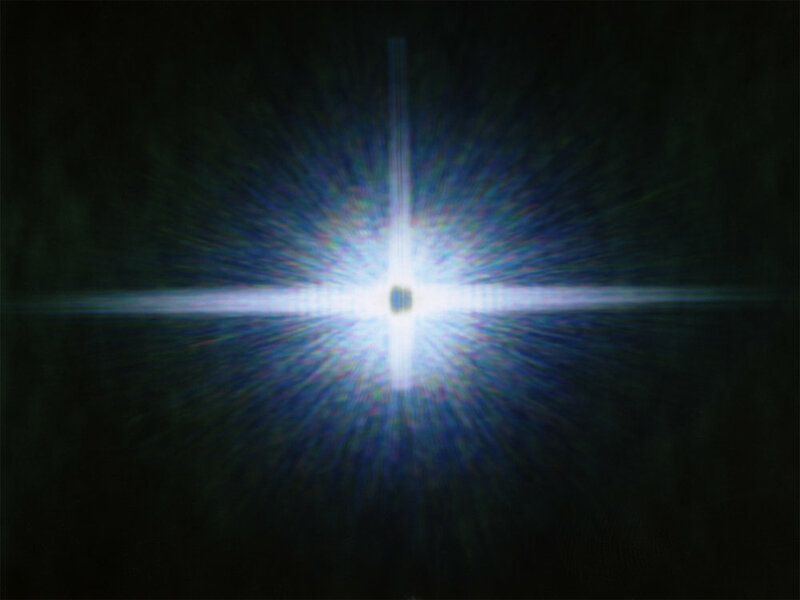 "Sub-Millimeter Array at 970MPH: Seven Minutes" Archival Pigment Print from Fujifilm FP-100C Instant Picture, 30"x40", 2017. 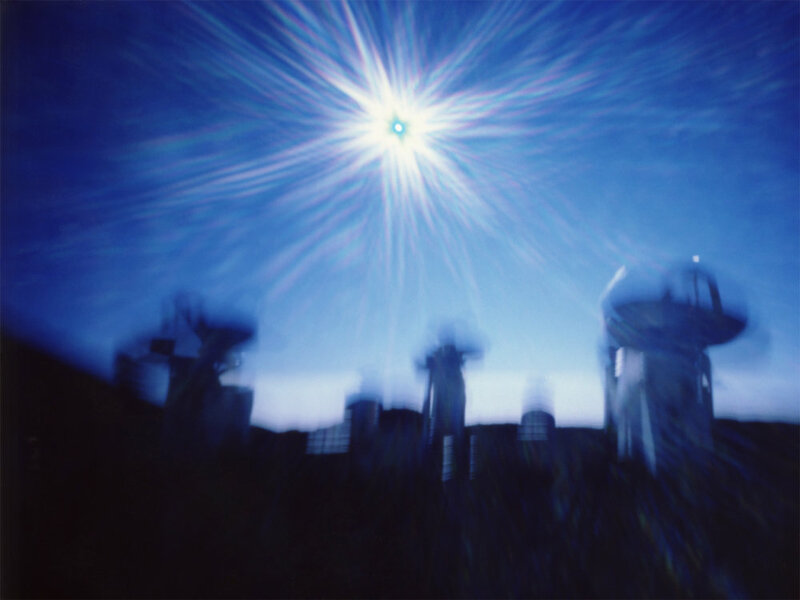 "Sub-Millimeter Array at 970MPH: Fifteen Minutes" Archival Pigment Print from Fujifilm FP-100C Instant Picture, 30"x40", 2017. "Sub-Millimeter Array at 970MPH: Thirty Minutes" Archival Pigment Print from Fujifilm FP-100C Instant Picture, 30"x40", 2017. 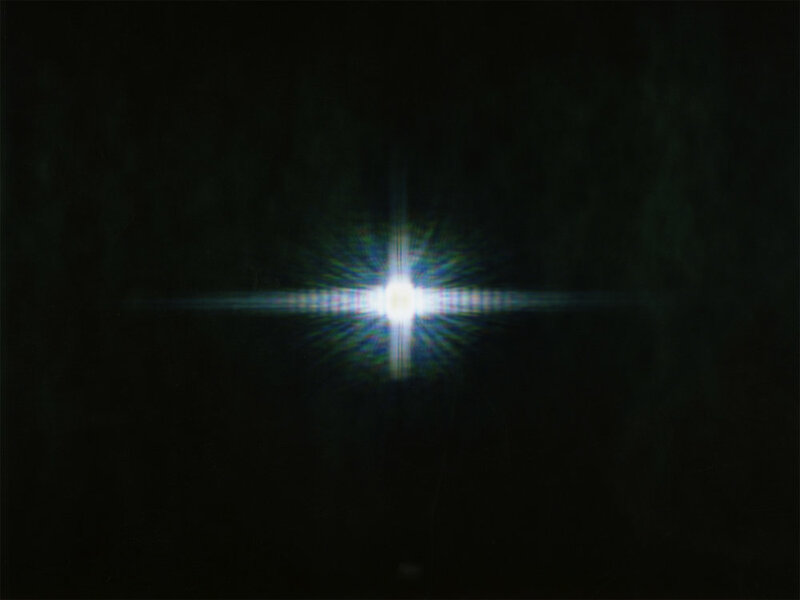 "Sub-Millimeter Array at 970MPH: One Hour" Archival Pigment Print from Fujifilm FP-100C Instant Picture, 30"x40", 2017. "Waves Study #023" Archival Pigment Print from Fujifilm FP-100C Instant Picture, 30"x40", 2017. "Waves Study #022" Archival Pigment Print from Fujifilm FP-100C Instant Picture, 30"x40", 2017. "Waves Study #021" Archival Pigment Print from Fujifilm FP-100C Instant Picture, 30"x40", 2017. "Waves Study #020" Archival Pigment Print from Fujifilm FP-100C Instant Picture, 30"x40", 2017. "Waves Study #019" Archival Pigment Print from Fujifilm FP-100C Instant Picture, 30"x40", 2017. Young’s Camera: Modified Polaroid Big Shot camera used for Waves. 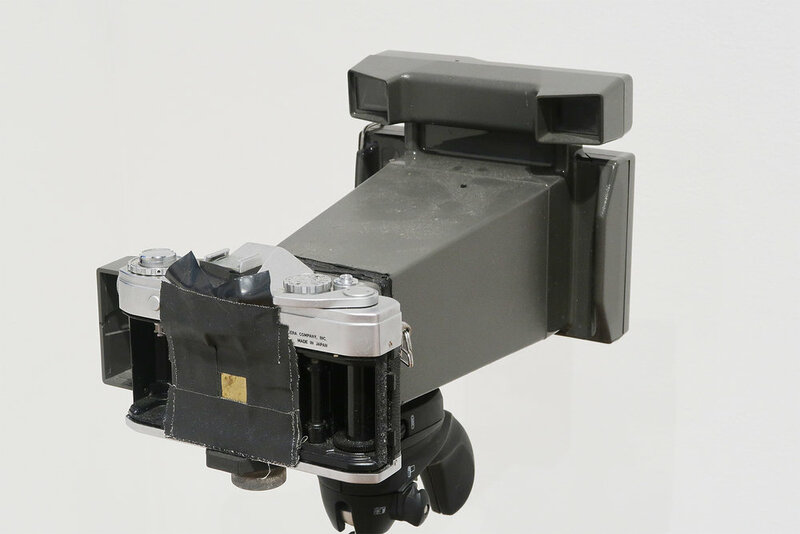 Salvaged Polaroid Big Shot camera and Canon SLR body, salvaged pinhole and double-slit slide. Last modification: 2017. 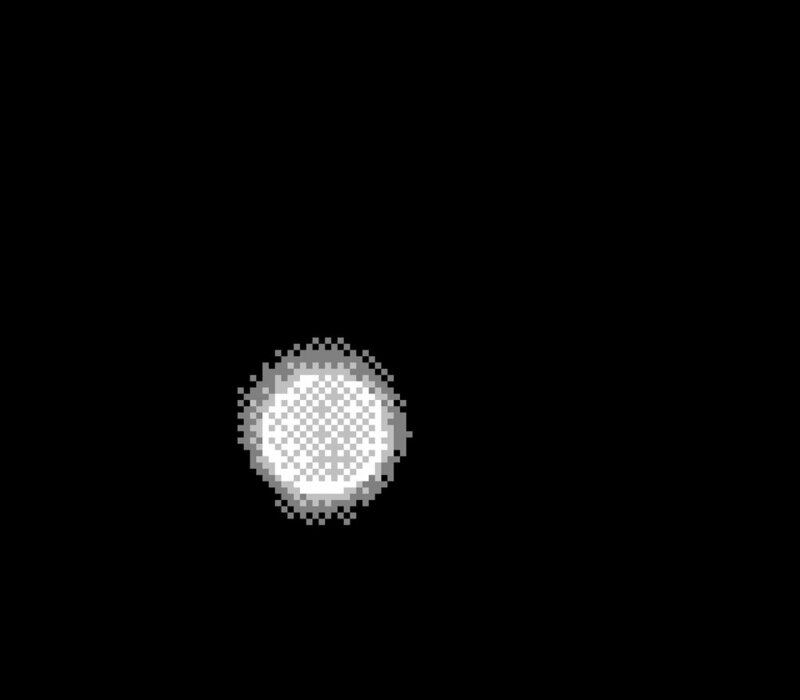 "Solar Track #02: 09/06/2017, 3:10pm-5:10pm" Digital Vinyl Banner from Gameboy Camera Images, 11'x10', 2017. "Solar Track #02: 09/06/2017, 4:10pm" BMP Image, 128x112 Pixels, 2017. "Solar Track #02: 09/06/2017, 4:14pm" BMP Image, 128x112 Pixels, 2017. "Solar Track #02: 09/06/2017, 4:18pm" BMP Image, 128x112 Pixels, 2017. "Solar Track #02: 09/06/2017, 4:22pm" BMP Image, 128x112 Pixels, 2017. Gameboy Camera outfitted with goggles including variable ND filter, UV filter, and IR filter. Last modification: 2017. 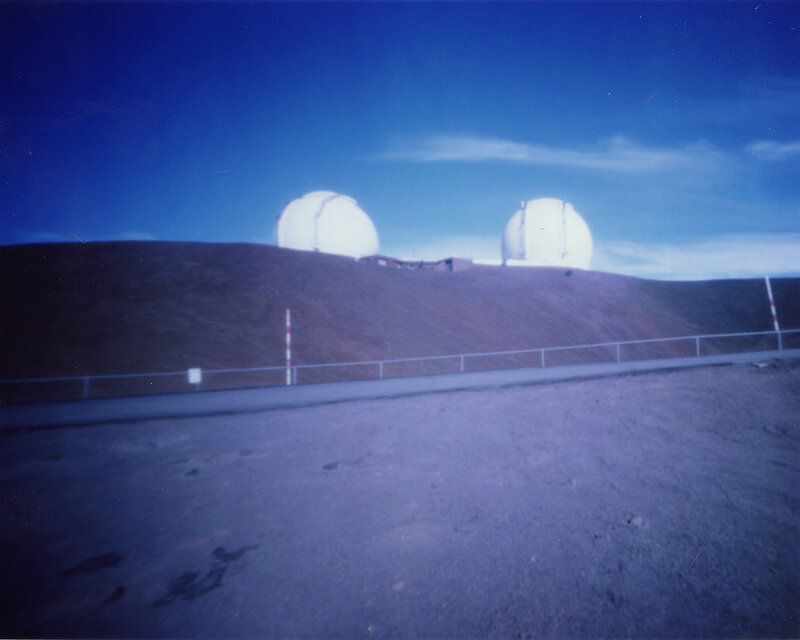 "Keck Telescopes at 970MPH" Fujifilm FP-100C Instant Picture, 3.25"x4.25", 2017. "Keck Telescopes at 970MPH: Seven Minutes" Fujifilm FP-100C Instant Picture, 3.25"x4.25", 2017. "Keck Telescopes at 970MPH: Fifteen Minutes" Fujifilm FP-100C Instant Picture, 3.25"x4.25", 2017. "Keck Telescopes at 970MPH: Thirty Minutes" Fujifilm FP-100C Instant Picture, 3.25"x4.25", 2017. "Subaru Telescope at 970MPH" Fujifilm FP-100C Instant Picture, 3.25"x4.25", 2017. "Subaru Telescope at 970MPH: Fifteen Minutes" Fujifilm FP-100C Instant Picture, 3.25"x4.25", 2017. "Untitled" Fujifilm FP-100C Instant Picture, 3.25"4.25", 2017. "UH 2.2 Meter Telescope at 970MPH" Fujifilm FP-100C Instant Picture, 3.25"x4.25", 2017. "UH 2.2 Meter Telescope at 970MPH: Fifteen Minutes" Fujifilm FP-100C Instant Picture, 3.25"x4.25", 2017.